Got out to Lester’s Square in the Marlborough Forest for an impromptu grouse and woodcock hunt with Hera. Left Ottawa at 4:00 pm, after work, picking up Jason and his dog Nos on the way out. We arrived at our desired hunting ground at about 5:00 pm which left us about two hours before the end of legal shooting time at 7:11 pm. It was warm, about 25 degree C and a slight wind was blowing. We set out and before long had a grouse flush wildly and unseen in a stand of pines. We moved on to an edge I expect to find woodcock and sure enough, Hera flash pointed one. I called out to Jason there was a bird up and he fired twice, missing cleanly. Hera checked the area where the woodcock flushed with great interest. A moment later I heard another shot from Jason. This time he found the mark, a woodcock, dumped cleanly when Jason pivoted to make the shot. He marked the spot where the bird fell, or so he thought, Nos found the downed bird a few yards farther then where Jason thought he had seen the bird fall. We continued the hunt, pressing on to another edge, where a Wilson’s snipe flushed. Jason noted where it touched down in the distance and we followed it up. We got a second flush, Jason shot and missed. With about twenty minutes left in legal shooting time, we made a sweep through another boggy patch that usually holds a woodcock or two. This time I put up a bird and managed to fumble with the safety on my 20 gauge Winchester side by side and not make the shot. This happens on occasion and has saved the life of many an upland game bird. I took it in stride, aside from the roar of exasperation I let out. We made our way back to the car in the last of the light and though Nos made a series of points, no more birds were seen. It was a good outing. Hera is coming along nicely in her development as a hunting dog. 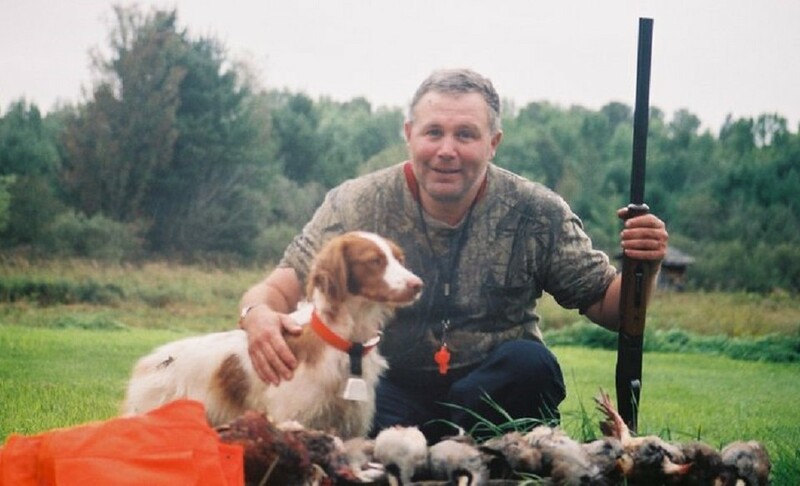 This entry was posted in Brittany (dog), Gun dogs, Hera, Hunting dogs, Pointing dogs, Ruffed grouse hunting, Small game hunting, Upland bird hunting, Woodcock hunting and tagged 20 gauge, Beretta, Brittany (dog), Brittany Hera, German Wirehaired Pointer, Hera, Hunting, Hunting dog, hunting season, Marlborough Forest, Nos, Ontario, outdoors, pointing dog, Ruffed grouse, shotgun, upland game, upland gunning, Winchester, Woodcock, woodcock hunting on October 3, 2013 by geoffreyandmika.